Sponsored by Open Road Integrated Media: Open Road offers its marketing expertise to other publishers through a new service called Open Road Ignition. Open Road Integrated Media (OR/M) has taken their success connecting with readers to the next level by offering publishing partners a full-service marketing program called “Open Road Ignition.” Through this program, OR/M will market backlist titles on behalf of other publishers across all sales channels. Earlier this year, OR/M announced that its newsletter business is up to more than 1 million subscribers. The popular newsletters have a very engaged following with a 28-percent conversion to sale. These newsletters include Early Bird Books for fans of discounted ebooks; The Lineup for fans of true-crime and horror; and The Portalist for fans of science fiction and fantasy. In addition, three new newsletters launched this year: A Love So True for romance fans; Murder & Mayhem, for mystery and thriller fans; and The Archive, for history and non-fiction fans. In 2017, the newsletters have delivered a 253-percent increase in ebook revenue over the same period in 2016. OR/M’s success with newsletters has sparked interest and attracted partners from across the industry, such as Hachette Book Group, Macmillan, HarperCollins, and Houghton Mifflin Harcourt, who feature their ebooks in the OR/M newsletters. The full-service program that Open Road Ignition delivers goes beyond newsletter placement to drive sales in a holistic way, including pricing optimization, metadata excellence, rich descriptive copy, and highly targeted advertising and marketing outreach. Eight years later, OR/M has not only done exactly what it set out to do with growing backlist ebook sales, delivering a 40-percent annual revenue growth on its catalog since the end of 2015, but OR/M has significantly grown its direct-to-consumer relationships through a series of successful newsletters and content sites. 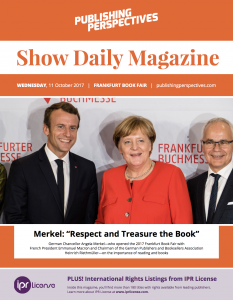 Download our Frankfurt Show Daily issue from Wednesday, October 11 to read this and other stories. A version of this sponsored story ran at the Frankfurt Book Fair in our Publishing Perspectives Show Daily magazines. You can download this issue and other Frankfurt Show Daily editions here.